When in doubt, never tweet. Over the weekend, Georgia Tech defensive lineman Brandon Adams suddenly passed away, leaving a void in the hearts of his family, friends and supporters of the Yellow Jackets football program. Unfortunately not everyone is the best at expressing feelings about such a loss. Georgia Tech offensive line coach Brent Key tweeted out a regrettable remark about the passing and the bringing in of a new recruit at the same time. Many saw putting this all in one tweet as disrespectful to Adams' family and were quick to call the coach out. Coach Key... are you talking about a recruit joining your program the day Brandon Adams died? 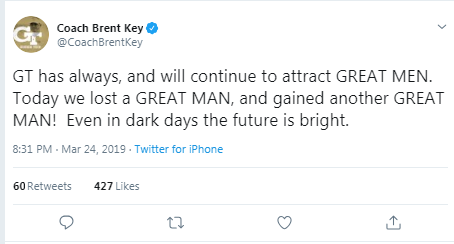 Key did try to clear things up but the damage had already been done.